What the literature tends to avoid, though, is something of similarly lofty power. I’m talking about the unacknowledged might of a serious night of sleep. For most folks I know, 6-7 hours is a luxury. Thanks in the very least to fitful kids, jobs whose stress contaminates dreams, the tendency for red wine to fuel a crash-awake/crash-awake sleep cycle, a temperamental middle-aged bladder -- thanks to this and so much more, an undisturbed 9 hour night of sleep is a faint memory from a decade past. On the once-or-twice per year occasion when a 9 hour night happens, the effect is freakish. It’s a taste of being a superhero or, to put it in more familiar terms -- doped to the gills. The pedals turn over with strange ease; gravity wanes on the climbs; bonus watts come free. Nothing is so intoxicating to the legs and the soul as a massive night of sleep. Why does it seem to go unmentioned? Is it because there are no books or meters or powders to sell as part of the experience? All hail the 9 hour night. – File under Sleep, Inlet to. And note the novelty, too, of the very existence of an hourlong video on Youtube. A rare bird indeed. In case you don’t know who Dylan Casey is, he’s an early era US Postal domestique (of the Marty Jemison, Frankie Andreu epoch.) Despite the specific subject matter of the video, Casey never rode the Tour. Nevertheless, success came to him later on, namely his choice in taking his first post-pro job in 2002 with a start-up called Google. ‘After the IPO, Lance started asking me if he could borrow money.’ A funny joke (I think), but not as funny as maybe the hottest thing on Twitter: @fakedcasey. Mix PRO bons mots with tech snark with 10th grade humor. Life has little more to offer. – The strangest part about Di2? It’s that your gears shift as soon as you press the buttons -- not when you release them. It seems like nothing ’til you have to get used to it. – It wasn’t a concept store, really. By design, it was more akin to a used car lot. Scratch & dent, surplus, last year’s slow moving colors, component overstock and oddities galore. 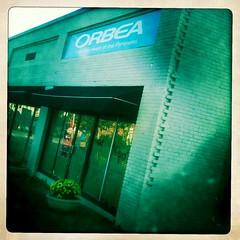 What you choose to call Orbea’s retail outlet -- factory store, non-concept store, whatever -- for a couple of years it was open at a fairly major intersection between 2 of Little Rock’s coolest neighborhoods. And judging by the number of Orcas ridden around town, they did a good business. Sometime recently, though, it shut down. The windows are papered up on the inside, tagged with graffiti on the outside (presumably not the typical rah rah Basque stuff associated with the brand) -- a vacancy consonant with the 100% of the units in the building. Reading the PR, the closing of Orbea’s store should presage the opening of something larger, more grandiose, and futuristic. The concept store not of tomorrow, but of a decade hence. And while it was billed to be open back in September, and while we’ve seen nary a sign of it, we’re nonetheless confident that it will appear. Our friend Tony Karklins is nothing if not tenacious. We hope it comes soon and that it has the glamour of your average summertime Barcelona babe. That is, radiant, magnetic, unforgettable. But in the meantime we’d suggest pulling down the sign from the original retail store. The way it lords over a dead-empty building on an otherwise busy road -- a sad subtext looms large. How? In another note devoted to PRO food, I bring you sea salt. Not just any sea salt, but Sal de Ibiza in its fancy teal ceramic jar and mammoth cork lid and fancy dollhouse spoon attached to it. It’s PRO because in the same way grim portions beget ballerina-thinness, limited seasoning begets kindness to Precious the Digestive System. A spare pinch of sea salt makes everything it touches turn delicious, but even better Sal de Ibiza is from the Baleric Islands aka Illes Baleares, the only islands to ever sponsor a PRO team. 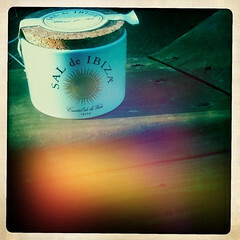 And even though a small jar of it costs around $13 in Spain, the less-fancy ‘Grain’ version is a steal. In 2011, the economic reality is that most pros who got a 1 year contract for the upcoming season took a nasty pay cut, so nothing is more PRO than a new devotion to frugality. Ultegra-grade Balearic sea salt? 2.2lbs, $12.95? Count us in. – To watch the trailers for ‘Red Bull Rampage: The Evolution’ is to become aware of a new potential dimension in made-for-TV cycling marketability. The panning helicopter shots and roaring music of the previews showed off the best Fuel TV has to offer. For those of you unfamiliar with Fuel TV, it’s a channel largely made up of surf and skate dreamscapes -- beautiful filmography paired with decent music. There’s the occasional travelogue, but otherwise narrative is rare and instead it’s fantasy: HD scenes of oceanic majesty (surf) or urban repossession (skate) made whole with whirlwinds of Dolby noise. The whole point of Fuel: Don’t tell a story. Rather, convey a vibe. It works, and sometimes I think Heaven is a warm night in Encinitas -- fish tacos, margaritas, sitting outdoors with endless Fuel on the television. It’s easy to wonder what Fuel would do with the Tour de France. If they gave it their surf treatment -- make the riders a function of the landscape, veritable Aeolian harps with no value outside of the natural environment that gives them their greatness -- I wonder how glorious it’d be. Maybe that was the mainstream value in that IMAX Tyler Hamilton movie that never happened? What I do know, though, is that the full-length Red Bull show was surprising misery -- more from the Versus TV production school of thought than Fuel’s. After a minute of stunning sky-high shots (signature Fuel stuff), it was a formulaic hour: 8 second crash sequence, 30 seconds of soft-focused contemplative rider interview, the same crash in slo-mo, then more monologue & up-close-and-personal with Darren Berrencloth’s nose hair. The amount of riding footage shown was anemic. And the pain of watching dudes who are professional battering rams trying to put their feelings into words -- the disconnect was gargantuan. Imagine Emily Dickinson being interviewed about fantasy football. Senseless. It was a huge bust. So much potential, so profoundly unused.